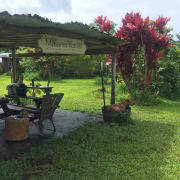 Please join Malama Kauai for our Farm Fridays, an opportunity for the community and visitors to join us on the Community Farm in Kalihiwai for a variety of service projects! We will meet every Friday from 9am-12 noon to take some time to mālama our space. This can be a wide variety of projects from more comprehensive workspace cleaning/organizing, garden tidying, and major projects (like revamping our greenhouse!). We are next to the North Shore Dog Park at Wai Koa Plantation, located in Kalihiwai Ridge off Kahiliholo Rd. Please bring sun protection, closed-toe shoes, and a reusable water bottle. Contact Julia at (808) 828-0685 x11 or volunteer@malamakauai.org with questions.